In honor of our very first offical post to our new blog and Valentine’s Day, we are offering 10 percent off your Liz James purchase! Anytime between February 11, 2011 and February 14, 2011, please enter the code CUPID at checkout to receive your discount. Our website is www.lizjames.com. We would also like to introduce Ruby! 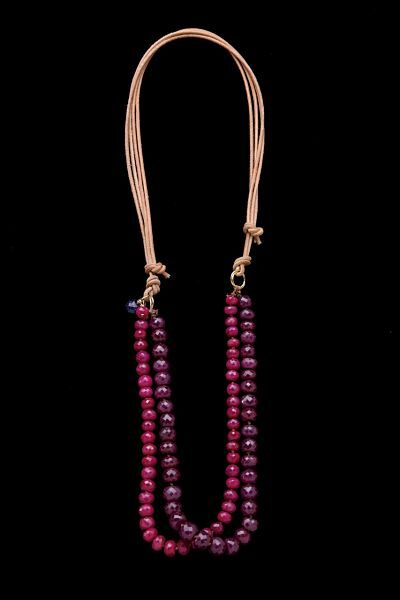 Two different colors and sizes of facetted ruby rondelles are hand knotted together on silk cord. This necklace﻿ has an adjustable leather back which allows you to wear it in many different lengths. A versatile piece, Ruby will warm your heart or the heart of someone you love – perfect for Valentine’s Day!